Here you get a chance to complete different challenges, conquer different maps, collect bounties and make your opponents pay. Since, it is online multiplayer game therefore as you progress in the game you unlock a wide range of perks and trophies which ultimately play a major role in your dominance in the game. The big disappointment is that this is basically a vehicular action game but the range of available vehicles is very limited. In fact, you just have four options to choose from; 2 tanks and 2 buggies. 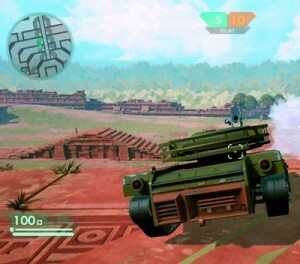 For us it came out as a huge surprise as the game does not fulfill its promise of being a perfect vehicular action game with very few vehicles to choose from. It’s not just that! At times you might feel the gameplay is too dull and clunky. Firstly, there is a lot of difference between the vehicles which forces you to completely change your game tactics. Huge tanks are very slow and it takes a lot of time to take your tank from one point to another. Though how lumber and slow they are but they have the potential to soak up a lot of damage and if main weapon is targeted properly then you can cause a lot of damage to your opponent. On the other hand, the small but fast buggies are quite vulnerable with very weak main weapon and are difficult to control. Apart from your main weapon there are multiple power ups scattered throughout the battle field but unfortunately you can carry one at a time. This sound too absurd but this is how it is! Lack of battlefields was another disappointment. All in all, Hardware Rivals has a strong story but lack of vehicles and maps fails to impress us. Exciting game to start with but gets boring with time. More vehicles, maps and good gameplay would have definitely made Hardware Rivals a huge success.